Northwest Drain Station, Inc. uses only the most modern technology and equipment available to tackle any of your plumbing or drain needs. We believe in up-front pricing and never starting a job without a customer’s consent. Our team of plumbing professionals are 100% committed to each and every job and they will take the time to answer any questions you may have. What makes Northwest Drain Station the smart choice for your Plumbing repair? On Time, Every Time – We understand that plumbing problems can be stressful, and the last thing you need is to have to wait around for a plumber. That’s why we’re committed to providing prompt service that won’t keep you waiting. Free, Honest Estimates – Our commitment to accurate, up front pricing means you will know exactly what your repairs cost. Affordable & Effective Solutions - We understand the core foundation of a home or business is a functional plumbing and drainage system. This is why at Northwest Drain Station, Inc. we will take the time to determine the best possible solution for your plumbing problem. 1-Year Workmanship Warranty - All plumbing repairs come with a 1-year workmanship warranty. Emergency Service - We offer 24-hour emergency plumbing services, 7 days a week for your convenience. 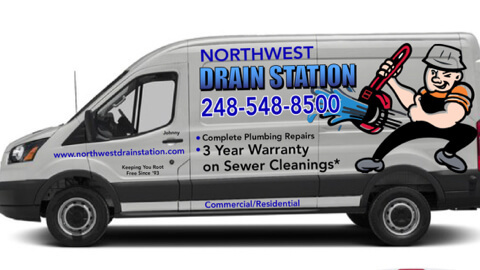 For fast service you can count on, look no further than the professionals at Northwest Drain Station, Inc. We provide professional plumbing repairs and drain cleaning services in Ferndale, Royal Oak, Clawson, Pleasant Ridge, Madison Heights and the surrounding areas. Call us today at 248-548-8500 for your free, no obligation estimate.